Jennifer Paul was born in Allahabad, India in 1943 to parents of mixed heritage. 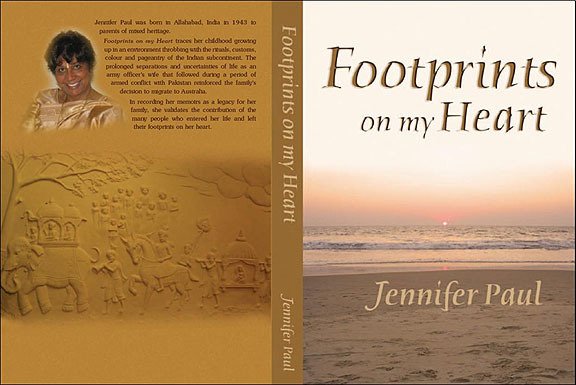 Footprints on my Heart traces her childhood growing up in an environment throbbing with the rituals, customs, colour and pageantry of the Indian subcontinent. The prolonged separations and uncertainties of life as an army officer’s wife that followed during a period of armed conflict with Pakistan reinforced the family’s decision to migrate to Australia. In recording her memoirs as a legacy for her family, she validates the contribution of the many people who entered her life and left their footprints on her heart. From time immemorial, stories and skills have been passed from generation to generation to be kept alive by descendants. Before words were written these treasured memories and stories were passed by word of mouth. This was my intention to leave for my children and grandchildren a record of our lives in the country of our birth India and the country we adopted – Australia. When someone asked, “ Will it be a warts and all account of your life?” The answer was a definite “No!” There are skeletons in every family cupboard but my book doesn’t aim to expose them. My story will never be a blockbuster movie sprinkled with all the S words like sensationalism, sarcasm, scheming, sordid spicy etc. It will lose direction and purpose smothering the core of the true story that will mean a lot to our immediate family. Others might find among the pages their story and be encouraged to record their own memories. I once read this quote in a desk calendar, “ Some people come into our lives and quickly go. Some stay awhile and leave footprints on our hearts and we are never, ever, the same.” (Flavia Weedn) Footprints on my Heart is the title of my book because I have recorded the positive influence of the many people who came into my life. There are also some negative experiences that have helped my growth as a person. However, negativity can sour ones vision and I tried to record only what would be of value to the reader. It is the true story of my life and my extended family. As young migrants we abandoned the safety and comfort of our family life in India and embarked upon an unknown journey to a foreign land. It is a simple story that seeks to echo the message that life is ours for the taking. We all have a contribution to make to our universe whether big or small. It encapsulates the essence that an ordinary existence is truly extraordinary in the completion of mundane but valuable contribution through simple works in varied capacities. Hopefully my story will revive the interest of people from all walks of life to explore their own stories to share with the younger generation. It hopes to give them courage to follow their own dreams. The life of every person who lives is interwoven in an intricate pattern to create a work of art and beauty. Unless we share our stories there will be no past. Our descendants will lament the lost heritage of a generation that failed to record the stories of their lives to bequeath to them. There is no future without a past or a present. For centuries in every culture of every nation a story has always communicated the strongest and most enduring of all messages. With the grace of God I hope mine will inspire my descendants and they will in turn add to these stories. I grew up with a wealth of books around me. I immersed myself in my two favourite volumes of Greek and Roman Mythology that fired my vivid imagination. I graduated to the more deep and philosophical writing of Rabindranath Tagore and more recently such prolific authors like Isabel Allende and Amy Tan. One can gain inspiration from their work but it can be overwhelming and I found myself floundering and daunted by their eloquence and mastery of language skills till I happened to watch one of Oprah Winfrey’s shows on the achievements of ordinary people. I felt something stir within me. I wondered if I had the courage to meet the challenge. Here I am nearly a year and a half later, completing what I believed was out of my reach! ‘Dare to dream’ they say. I echo that same sentiment whole- heartedly. If one person can be inspired after reading my book then it would have been well worth the endeavour. As I begin to record details of my life and those of my siblings and extended family, I feel the presence of my beloved parents and ancestors, who must smile at my poor attempt to record a glorious past and my hopes for an even more glorious future for our descendants. For within the pages of this book I am echoing my love for all those past and present – who have left their footprints on my heart! In its shade a mother rocks her baby on her knee. Into the morning sky curls of smoke begin to creep. Swirling shades of blue and green dizzy in one’s head. As worshippers in temples leave garlands where they knelt. Under its shady branches workers sleep and dream. Their tiny nests balanced between like lemon wedges. Disrupting the routine of the industrious busy bees! Mother squirrels piggyback their babies out of harm. Pretty anklets jingling under brightly coloured skirts. Balancing earthen jugs on heads leaving watery trails. While pigeons watch impatiently waiting to intrude.